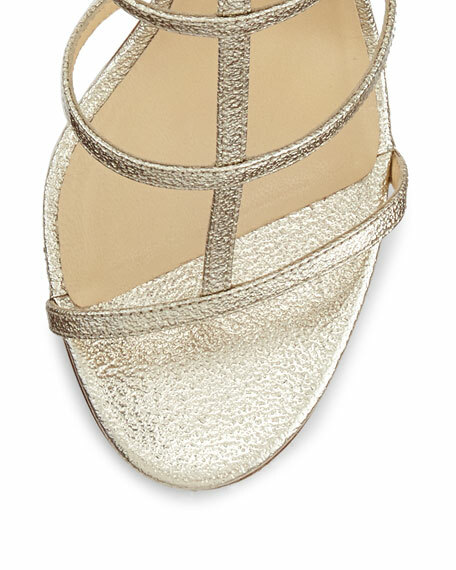 Jimmy Choo varnished textured metallic leather sandal. Ankle strap with golden buckle and stretch inset. Padded leather footbed; smooth leather outsole. "Dory" is made in Italy. For in-store inquiries, use sku #1555256. Alexandre Birman strappy sandal intertwined in velour and metallic snakeskin. 4" covered stiletto heel. Thin strap bands open toe. Cutout vamp. Adjustable ankle strap. Cutout heel counter. Padded footbed. Smooth outsole. "Nolita" is made in Brazil. 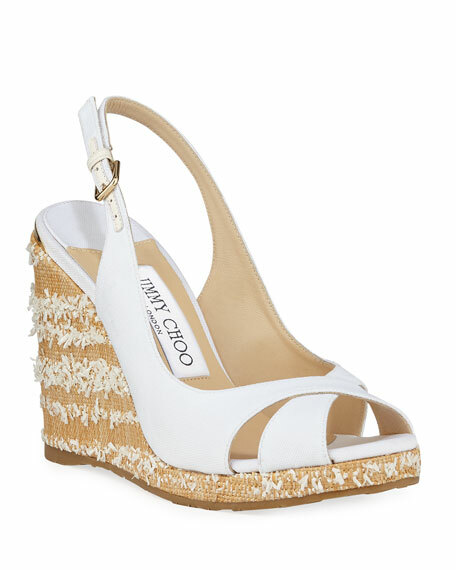 Jimmy Choo mule sandals in braided rope and metallic calf leather. 2.5" cork block heel. Open toe. Cutout vamp. Slide style. Leather lining and sole. "Dean" is made in Spain.